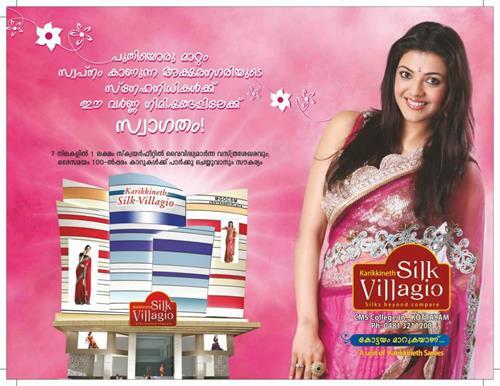 Karikkineth Silk Villagio Kottayam inauguration by Kajal Aggarwal will be held on 4th April 2013 at 10 AM. Don't miss to watch the inauguration live on television and online streaming (webcast) on those websites which would stream it live. Situated near CMS College Kottayam, the Karikkineth Silk Villagio is a 7 storey building spread across 1 lakh sq. feet. Being the paradise of clothes, the Villagio would add more colours to the enchanting beauty of Kottayam. Karikkineth is a branded name much familiar among families living in central Travancore. Following the fashion trends happening across the world, Malayalees who live in Pathanamthitta, Alappuzha and Kottayam too are keen to bring changes in their tastes and fashion sense. Keeping an eye on the interest and pulse of customers, Karikkineth Group with 75 years of excellent service is taking a step forward with the huge opening of their new show room at Kottayam. The Karikkineth Silk Villagio at Kottayam is projected to be the paradise of shopping freaks which leaves no space for them except an exciting experience. Karikkineth Silk Villagio at Kottayam would be inaugurated on 4th April 2013 with the blessed presence of Kajal Aggarwal, one of the top actresses in South India. Spread across 1 lakh sq. feet in a 7 storey building, the mind blowing construction of Silk Villagio would cool the minds of the customers. More than being a shopping destination, customers can enjoy food from the attached restaurant which could give time for relaxation and add more productive hours. Parking facility for 100 vehicles and special space for the enjoyment of children are being arranged. Then inauguration of the Silk Villagio would be attended by prominent personalities adding glitters to the function. On the eve of the opening ceremony, Karikkineth has arranged a special gift, an Eon Car. The Karikkineth group has already initiated 'Charity Chariot', a social service program to help the needy and helpless. As a part of Platinum Jubilee, 75 sewing machines along with financial support for 75 students studying for Plus One and Plus two had been provided. The inauguration of Karikkineth Silk Villagio at Kottayam will be held on 4th April 2013 at 10 AM. Situated near CMS College Kottayam, the Karikkineth Silk Villagio would add more colours to the enchanting beauty of Kottayam.